Tortilla Chopped Salad is a hearty, vegetarian salad that is filling and satisfying enough to have for dinner. Does it mean you’ve unlocked some sort of adulthood merit badge when you can say with all seriousness that you totally love salads? You would have almost never caught me ordering a salad in a restaurant when I was in high school or college or heck, even a few years ago. But now, I make a beeline for the salad section of the menu whenever I’m out. Especially if they offer big, beautiful bowls of dinner salads. I love salads that are hearty, filling, and delicious—and creative! I’m not interested in a bowl of iceberg lettuce with some pink tomatoes. Give me interesting, complicated layers of flavor in that salad bowl! With my newish-found love of salads, I’ve been really working on upping my at-home salad making game. I have to be honest, a lot of my at-home salads in the past years have been solely utilitarian. A dinner needed some veggies, so I tossed some greens in a bowl and threw some dressing on top of it. Then I hurry up and scarfed through it first so I could get to the really good stuff. What a sad state of salad affairs. Now I know that homemade salads can be so much more than just obligatory. They can be complex and hearty and satisfying and totally worthy of the limelight. Man, I love me a good salad. I think the key to making a main stage salad is all about finding balance. Balance in flavors. Balance in textures. Balance in nutrition. You want every bite to be full of interest—and a salad done right can provide that kind of interest unlike any other type of dish. This tortilla chopped salad was inspired by one of the first salads I actually learned to love—a giant Latin-flavored chopped salad from a little restaurant across the street from my dorm in college. It was probably the first time I realized that salads can be so much more than just something my Mom put on the table at dinner (and that I didn’t eat). That salad was impossibly huge (as restaurant portions tend to be) and came with roasted turkey breast. I’ve scaled down the size of my salad—it’s still huge, but you’ll be able to conquer it without unbuttoning your pants. And I left off the turkey. I love meat as much as the next omnivore, but I feel like this chopped salad really doesn’t need any meat. It’s packed full of healthy plant-based fats and protein, and it’s got enough heft on its own so that you’ll feel satisfied after eating it—even without the meat. 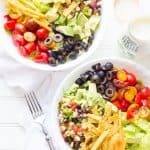 I know ranch dressing’s reputation has taken a hit over the past few years (what, with people drowning their pizza-wrapped cheeseburgers in the stuff), but cool, creamy ranch is such a wonderful flavor complement to spicy foods—it really is a perfect way to dress a Latin-flavored salad like this one. The keys to doing ranch right—use it in moderation and find a dressing that is made up of real ingredients. Some of the bottles of ranch on store shelves have ingredients that are barely recognizable as food, if at all. Read your ingredients, people! That’s why I’m totally loving the Marzetti® Simply Dressed® line of salad dressings right now. They have no preservatives, no high fructose corn syrup, no artificial colors or flavors. They are made with 100% “real” ingredients. Basically, they are pretty much what you’d make in your own kitchen if you made your own salad dressing—except more convenient because, you know, they’ve already made it for you. 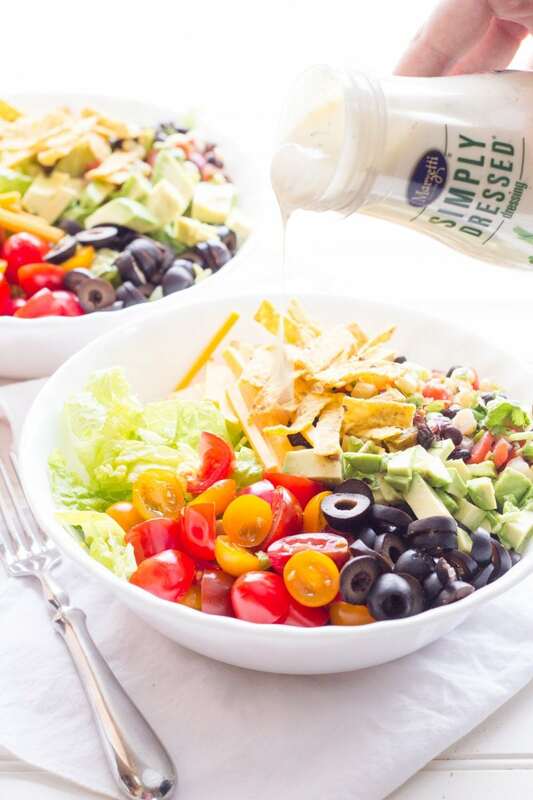 Just a little drizzle of the Simply Dressed Ranch on top of this chopped salad is all it needs to really set off the flavors. It’s not about covering up the flavor of vegetables, it’s about adding another wonderful layer of flavor and texture to your salad. It’s about taking your salad to the next level (I can’t believe I just typed that). This is a salad that I will happily eat even if I don’t have any veggie quotas to fill. In a medium bowl, combine all the salsa ingredients and toss until well-combined. Set aside while you assemble the salads. Divide the salad ingredients between two large salad bowls. Add a big scoop of the salsa on top of each salad, and then drizzle half of the salad dressing onto each salad. Serving immediately. 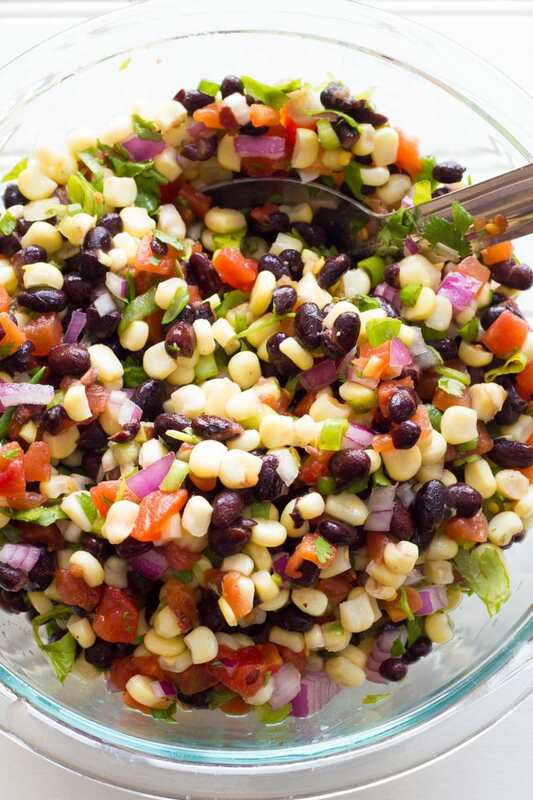 You’ll probably have extra Black Bean Salsa leftover. Serve it up with tortilla chips for a snack the next day! 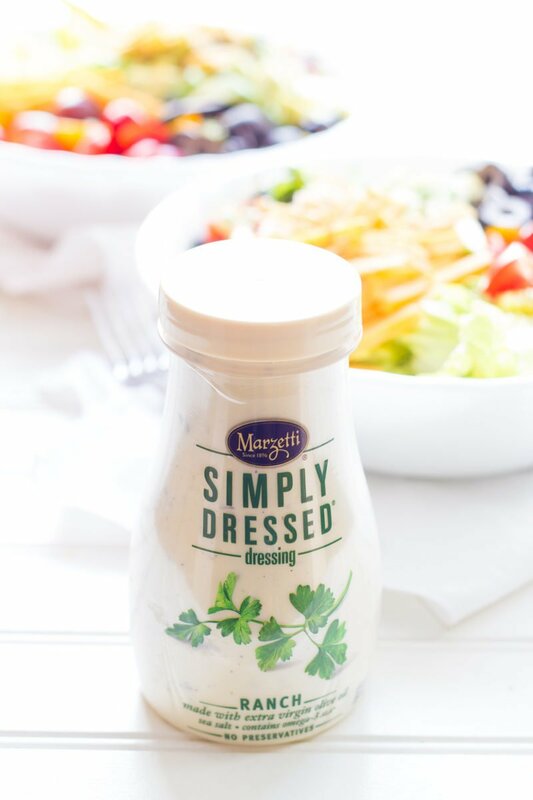 How will you use Marzetti® Simply Dressed® refrigerated salad dressings to make fresh and simple meals for you and your family? we host a Sunday night dinner club, and this would be great as it fits many of our food allergies. That Greek Feta dressing would be great with summer produce! Yum! I just used the Marzetti balsamic to top off a salad of baby arugula, Asian pears, avocado, and gorgonzola. So good!! These really are the best dressings! I love the greek feta one with some romaine, hummus, cukes and tomatoes. The strawberry poppyseed is perfect for this time of year – so fresh tasting and delicious! I like it with greens, goat cheese, walnuts and fresh strawberries. Yum! Makes me want to eat all the lettuce! I’ve always wondered about whether or not there was a healthy version of ranch dressing! Thanks for the tip about Marzetti products Cassie. Okay this look AMAZING! Their dressings are SO GOOD I love the Ranch! Yummy!! Love new salad ideas! I would use the Ginger Sesame Salad Dressing to make a chicken and veggie dinner. I love your healthy salad! I am going to make it. I am going to use the all natural Ranch dressing to make my Cold Chicken Pasta salad that I make this time of the year! This Marzetti dressing is the best tasting! The Greek Feta Dressing sounds great as a sauce for falafel! We use Marzetti Simply Dressed dressings already on our salads! Even my kids enjoy them! I would love to have this salad for family taco dinner night! Love salads like this! We have a very similar version in our home that makes a dinner appearance every week or so. I’m a huge ranch lover, but have cut back since it’s so unhealthy, though I’ll have to give this brand a shot! This salad look so delicious. I can’t wait to give it a try this weekend! This is definitely a step up from my usual salads. I’ll have to give it a try this weekend. I love this dressing! I use it all of the time. That salad looks so delicious. I would make noodle salad with tuna. That dressing looks great! Just in time for a summer full of salad. We have been putting ranch on our Latin salads for years! My husband does a combo of ranch, sour cream and tapatio, plus salsa and YUM! Looking forward to trying the Marzetti! I would use Marzetti dressing in a grilled chicken and salad wrap. Note to self…don’t read blog with delicious recipes and food pics an hour before lunch break. Ah but it looks so tasty! Thanks for sharing about the new dressing. I like that it appears to be a smaller size too. That means there is less waste without preservatives when it’s just for me. This looks amazing! I’m right there with you… I really do LOVE a good salad! I would love to try this salad with this dressing, sounds awesome! I can’t remember how far you are from a Trader Joe’s or if you ever shop there, but they have a frozen roasted corn that is awesome! I’ve loved salad since I was a kid and one of my boys is the same way. Salad lovers unite! I would marinate chicken using the Marzetti ginger sesame simply dressed salad dressing to make a Asian chicken wrap with bell peppers and broccoli slaw. I would then use the dressing as a dip for the wrap. We have that very dressing in our fridge right now! :) and love it on vegge, topping filled salads! I wish I had seen this post yesterday before purchasing a bottle of the usual store stocked ranch dressing! I’ve been jamming on my own ranch recipe for the past year, but I’ve got a bunch of veggies languishing in my fridge and needed a quick and easy way to scarf them down.for dinner with no fuss (5 month old at home, day of no a/c at work = no additional effort desired). I just looked at the ingredient list and nutrition info on their website, and this looks soooo much better then what I bought..
I’m a vegetarian with a carnivorous family who loves Ranch dressing. This is perfect! I’m adding this to my family’s menu next week…sounds delish!!!! I would love to use the Greek Feta Salad Dressing on a grilled chicken spring salad. I would use the dressing to make salmon teriyaki with sesame scallion soba noodles for my family. That salad sure does look good! Thanks for the giveaway! I would first try Marzetti’s Ranch as a dip for veggies…a healthy update for a childhood classic! Such an easy, fresh and delicious salad – this is a recipe I would LOVE to make! What a wonderful looking salad. I buy Marzetti dressings often, they are so fresh tasting compared to the regular shelf brands. I have a similar Taco Salad recipe that I would use the dressing for! I love it! I love Marzetti salad dressings…so tasty! I would use the Pomegranate dressing to make a delicious salad with pieces of grilled chicken mixed in. Mmm this looks so delicious! I have to make this someday. love it, its hard to find a ranch dressing without msg! Thank you for the giveaway. i’d love to try this. I’ll use the Marzetti Simply Dressed Ranch to make toasted cheesy ranch tuna salad sandwiches. Delicious! I adore salads – since I am an unusually picky eater, I tend to eat more and more salads every day for lunch. Because my work cafeteria’s food isn’t generally to my tastes, I use their salad bar frequently and find myself adding things I’d never have thought to add before just to add in a bit of protein and fats to make it a filling meal. I could see myself bringing this dressing to work with me as I use only their oil and vinegar (the others are so full of sugar and other things I can’t pronounce that I don’t eat them). I would make this salad which has ingredients I love to eat. Your salad looks amazing. can’t wait to try it. This recipe looks amazing . Im going to try it this weekend. I;D LOVE TO TRY SOME IN SOME COLESLAW! The salad and the photography look excellent. Thanks for the giveaway! Salads are my go-to easy meal, especially in summer. I would like to try the Strawberry Poppyseed Salad Dressing on a fresh fruit salad. I’d love to make chicken caesar salad with Romaine, Tomato, carrots, radish, cooked chicken croutons and Marzetti Caesar dressing. Thanks so much. I like this brand of salad dressing. Your salad looks wonderful. I’m anxious to try Marzetti dressings. Plain and simple is the best! I’ve never tried Marzetti salad dressing but I would like to try the ranch. totally making that salad – right up our alley! Lovely! 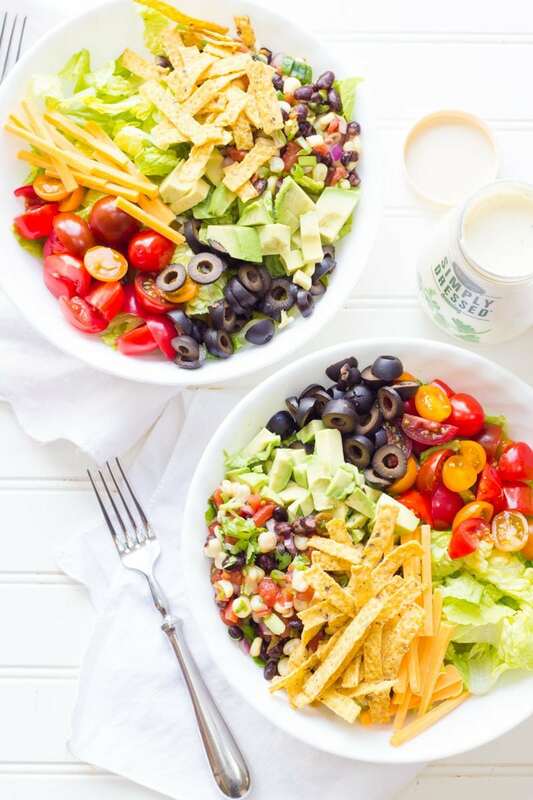 These salads looks super yummy. I will have to look into this dressing next time I need some. thank you! I would use any of these dressings with a veggie pasta salad. I love the great flavor that these dressings have. Thank you! We’re simple, so we’d use the dressing for salads most of the time. All of this looks delicious and healthy too! I am with you…there is nothing quite like a great salad. I like the fact that these dressings have REAL ingredients. Marzetti is my favorite! We have salads every night with dinner and love to try the different selections they offer. This one looks great! I’d like to use the dressing as a dip for a fresh plate of vegetables. Love the salad you created! Wow, this recipe looks delicious! And pretty simple to make. 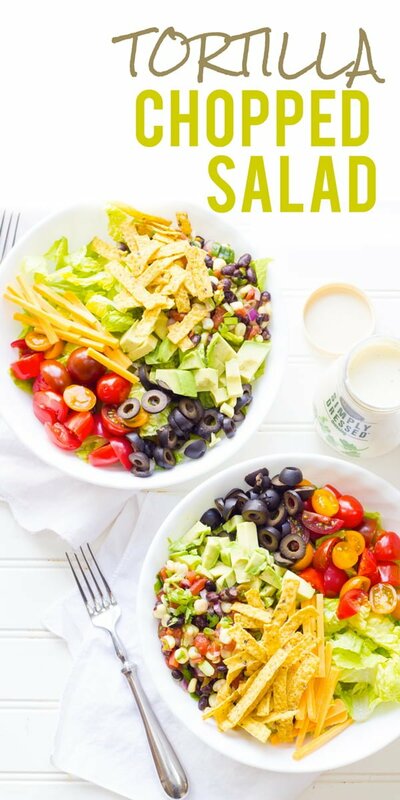 These salads look amazing! So colorful and perfect for summer! I love how the dishes burst with color. I think it would be really good in a pasta salad. I love ranch with southwestern flavors. This looks really good. Marzetti is my favorite brand of salad dressing. I use the slaw dressing to make deviled eggs. Easy easy! I would use the salad dressings over advocado and banana chip kale salad! A chicken salad would be perfect with one of these dressings. I would use their dressings as dip for veggies for my boys, and also as marinades for meat. I enjoy trying new salad recipes, especially during the Summer months when fresh ingredients are available! Marzetti® Simply Dressed® always taste so light and fresh! I love how it makes my veggies taste! I would love to use these dressings with fresh, seasonal produce and grilled chicken for the summer months! I would love to make a fresh veggie salad and top it with their dressing! we like eating salads during the summertime and would enjoy these salad dressings! I love a good Southwestern Salad. 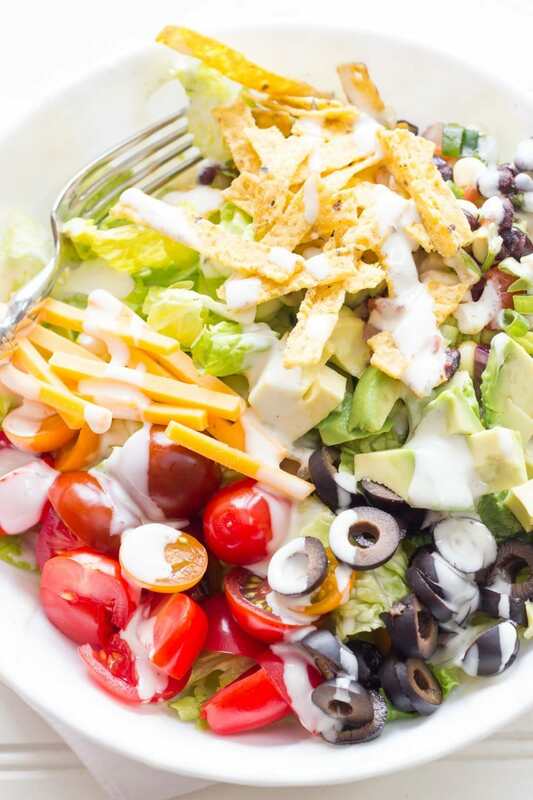 This looks so delicioius–I just love Mexican salad recipes, especially with ranch dressing. Your recipe looks so delicious ! My daughter has been enjoying her carrot and celery sticks with Marzetti® Simply Dressed® refrigerated salad dressing! I have a recipe similar to this, but this seems to have a little more “oomph.” I’m definitely pinning and trying! This looks like the perfect summer dish. Thanks for the recipe. We have our own garden, so we will be making lots of salads. I would use this in my potato salad. I Love Ranch so this salad looks really yummy ! Thx for the recipe! This chopped salad recipe looks amazing and much more amazing to taste it. I must try this salad, it’s so summer! LOOKS AMAZING! I would visit my fresh produce section and choose the veggies, berries, and seeds that I love in my salads and top it with this dressing. My family loves Ranch dressing. We use it on everything from baked potatoes to french fries to grilled chicken sandwiches. Your salad sounds wonderful. I would love to try the dressing in my macaroni salad. not a big salad fan but this looks great! I would use the Light Veggie Ranch Dressing on a wedge of cold iceburg lettuce and then coat it in veggie bacos and finely shredded cheddar cheese. MMMM! I can’t wait to check out their website for recipes!! I definitely want to try the ranch on my salads! I would use it on all different types of veggies. I absolutely love this recipe. Glad I found this post, I have a picnic I have to take a dish to Tuesday and this just made it easy for me. I’d eat a salad everyday if I could ! I love trying new things, would be great with salads! Marzetti’s dressing is a memory from my childhood. I love ranch dressing, especially as a dip for fresh veggies. This salad look great so I’ll be trying it soon. wow. that looks really timely! That looks so good! I would use the dressings on grilled chicken salad. I really love this salad. Looks like a great way to use fresh summer vegetables. Thanks for the recipe! My mother God Bless her she always loved your dressings and we always had them at her house. So I have continued that tradition and I serve them at my home too!!! This salad looks great!!! We are going to try it!! I’d use it daily on my lunch chicken chopped salad. Your salad looks so good! We have salads almost everyday and sometimes indulge in ranch. It;s nice to have a more natural alternative without having to make my own. Looks delicious! I am ready to eat! Their dressing is great for more than just salads. Dipping sauce, for example. Good stuff. Thats looks awesome I’ll definitely try this salad! I would use it to add some flavor to my salads. I use Marzetti Simply Dressed refrigerated salad dressings to make a killer Tortilla Chopped Salad with Ranch dressing. I would love to try the Marzetti ranch. I take a grilled chicken salad for lunch each day and would love to spice it up a bit. Yummy! Making this for my family tonight ???? It would be great to marinate chicken and use on wraps. The ranch flavored Marzetti dressing would go well with chicken wings. I would love to use the dressing to make that delicious salad you showed. dressing would be perfect for our salads. I enjoy a fresh salad with ingredients from my local Farmer’s Market. I like the Marzetti Simply Dressed Balsamic Vinaigrette. I have used Marzetti Blue Cheese dressing before. It was really good and full of blue cheese chunks. I am going to make this Tortilla Chopped Salad. It really looks good. I will use it to make a delicious veggie pasta salad! i love their ranch dressing over a lovely Cobb salad. I’ve always loved tortilla chips in my salad. I love using ranch dressing in just about everything. My kids love it on their french fries and mashed potatoes. I would use the Ranch Dressing on grilled chicken salad. I would try the Champagne Salad Dressing to jazz and dress up my apple, pecan and chicken salad. These recipes look delicious! Thanks! I would use Marzetti Simply Dressed Ranch Dressing on our Turkey Bacon Wraps, as well as to top our Spinach Salad! Thank you for sharing the creative recipe, cheers!